This is apropos to this review, since if one isn’t “cunning of hand,” one might slice one’s face! About two weeks ago, I was on Facebook and one of those pesky ads appeared in the sidebar. But it was a very well designed ad, and being a fan of design, I was wont to look at it for more than a nanosecond. It was an ad for razors. Now, for a couple of months, I’ve been listening to Howard Stern talk about the Dollar Shave Club. Those radio spots have taunted me with the hundreds of dollars I’ve wasted over the years on overpriced razors instead of buying them direct. 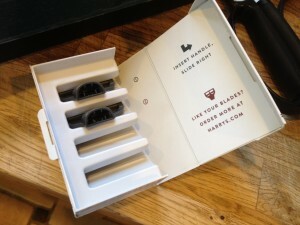 After a while, I was thinking, “Yeah… I think they’re right.” But despite their cool website, a viral video campaign, and Howard’s support, I never got around to ordering the blades that would save my wallet and my face. So when another “blade by mail” ad appeared in my Facebook feed, I was curious. Surely there wasn’t another Dollar Shave Club, was there? The ad in question was from Harry’s. Never heard of them? Neither had I. But as I said, I’m a sucker for good design, so I clicked on the Facebook ad and went to their site. Which I love. It’s nice and clean. Like after a good shave. But I don’t want to droll on about their website. I want to tell you about their razors. After poking around, I learned that the founders, Andy Katz-Mayfield and Jeff Raider, got together with some German engineers and together designed an ergonomic razor with awesome blades. As opposed to the Dollar Shave Club, which offers three different choice of cartridge, Harry’s only offers one: It has five blades which they describe as being shaped in a “Gothic Arch pattern.” They offer two different beautifully designed handles: The Truman (zinc alloy core, $10) and The Winston (precision grade aluminum, $20). So they look pretty, but can they shave? It was time to get neck deep in shaving reviews. I found a fun blog called “Razorpedia.” They had some good things to say about Harry’s as well as Dollar Shave Club. I then stumbled upon a lifehacker article about Dollar Shave Club and where they got their cartridges: Turns out they are made by Dorco. Who? More investigating! Razorpedia reviews and loves Dorco blades. Apparently, they are a Korean based company that makes super awesome, really well reviewed razors. So why did I eventually buy a razor from Harry’s? As our first partner, we’re incredibly proud to give a shave to The Mission Continues. The Mission Continues empowers veterans of recent wars to apply the skills they learned in the military here at home through six-month fellowships with a non-profit organization. Through the fellowship program, they renew their own sense of purpose and better the lives of those around them. Fellowships often lead to full-time employment, pursuit of higher education, or a permanent role of service. We can’t imagine a more deserving group of skilled leaders than our veterans and The Mission Continues Fellows and are proud to give a shave to The Mission Continues. I like that: A company with a conscience! Okay. So I like the design, the reviews seem good, I like the company philosophy… but the only way I’m going to know if it’s a good shave is to actually shave! Their standard free shipping came pretty darn quick. The whole kit and kaboodle (that’s a shaving term, I think) came in a very pretty (read: manly!) box. 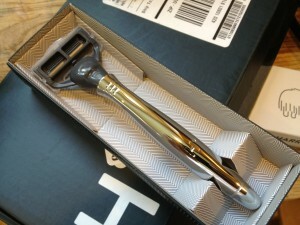 The razor itself looks great and feels really good in your hand. The razors come in a cute box with a wooly mammoth on it. Cuteness factor is high. Time to put the razor to the test. Easy to get at these blades! The construction of the razor cartridge threw me for a bit. The cartridge and plastic casing bends backward pretty far. I’ve been accustomed to the Mach 3 from Gillette, which has a pivot head with a limited angle. But the razor casing from Harry’s is both light and durable, bending all sorts away around my neck, chin, cheek… I was shaving off about three days’ worth of growth and it went through like buttah. Just a few weeks prior, I went to the barber and got a straight razor shave, which kept flashing me back to scenes from Sweeny Todd. As good as the barber was, as steamy as the three hot towels were, as nice as the cold cream was, I didn’t get as close a shave as I did from Harry’s razor. That’s why I decided to include this review in our blog. It really was that good. After I shaved, I kept feeling my face and was surprised to see how close the shave was and how smooth the shave lasted throughout the day. Katz-Mayfield and Raider and their team of engineers and designers hit a home run. They have embodied what it is to Make Tech Better. 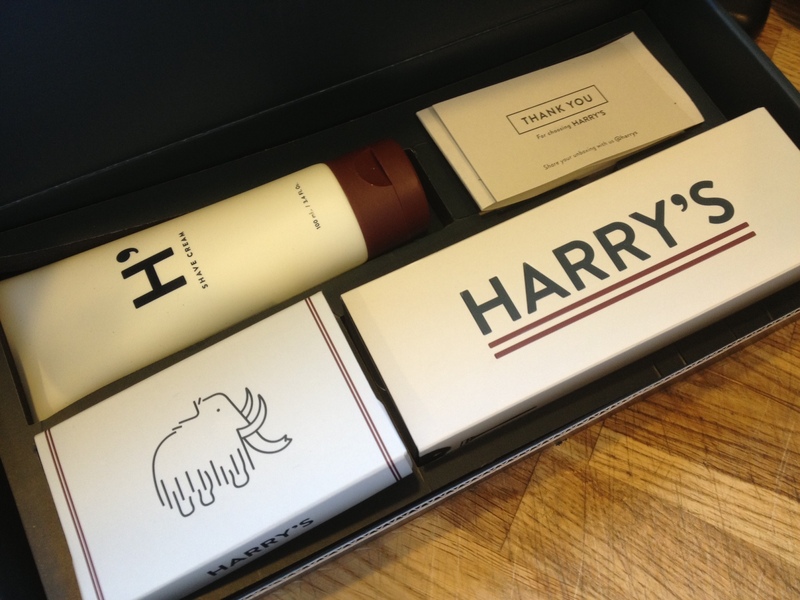 I never thought of myself as a shaving snob, but Harry’s has won a customer in me!